While you persuse your seed catalogs in February, give a thought to the garden in midsummer; over run with weeds. Couldn't we all use a Night Gardener? With breathtaking illustrations and spare, sweet text, this masterpiece about enjoying the beauty of nature is sure to become an instant classic. "A treat, with artwork worth lingering over." "It is a pleasing collaboration with art bound to both haunt and delight." "An elegant picture book that celebrates creativity and community." "The message about the transformative power of art is a powerful one, and the intriguing premise and graceful art are definitely captivating. 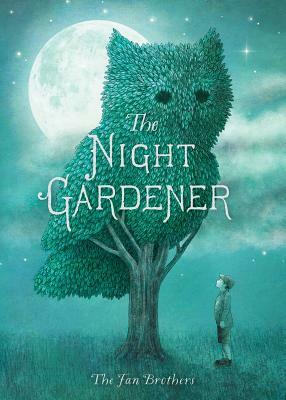 Reminiscent of Chris Van Allsburg’s imaginative works as well as Lane Smith’s Grandpa Green."